The Wolf Hybrid came into existence with the crossing of the Arctic Wolf and a large dog. This breed is very rare in the world, there are some countries where the Wolf Hybrid is banned so it is really important to check local laws before purchasing that breed. This breed of dogs is very large and aggressive. They have long limbs, and are agile and muscular. They face looks like a Wolf with a long and straight muzzle. The Wolf Hybrid is not recommended for inexperienced owners. They are very aggressive and fast, they are loyal to their family and master. This dog breed can be used as a guard and watchdog, they are very suspicious of strangers, they are not good with children and older people. 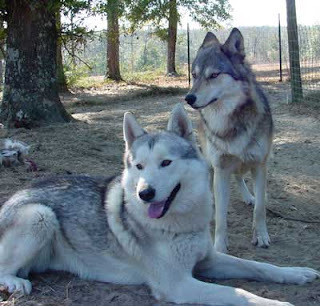 The Wolf Hybrid has a double coat which is extremely dense. This breed requires early socialization and obedience training. This dog breed is not easy to train, the training should be done with fairness and patience, they will not respond to hard and harsh methods of training. The Wolf Hybrid has high endurance and energy they are not good for apartment living with small children. They do well in rural settings. This dog breed requires regular brushing and bathing should be done when needed with a dry shampoo. The Wolf Hybrid is a relatively sturdy and healthy breed and is not known to suffer from many diseases and health issues that affect most dog breeds, the most common ailment this breed suffers from is Hip Dysplasia. As a dog owner it is your responsibility to provide a healthy environment for your dog and keep it free of any diseases that might affect it, if you see any signs or symptoms of illness in your dog be sure to consult a vet for an early diagnosis and treatment.